changing room I picked up a little book called "Father To Daughter". I started reading it, and figured if Lydia could buy a few dresses, I could at least get a $7 book. 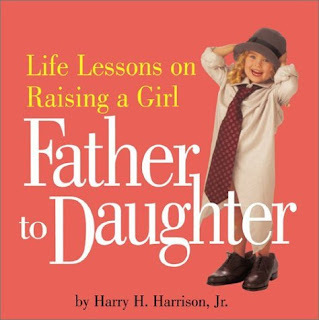 Each page has a couple of sentences about raising a little girl. I love this book and have read from it almost daily ever since I got it. "She may look adorable, but be forewarned - her diaper is going to be just as challenging as any boy's." "Let her sleep on your ches when she's a baby. This is when the world begins to make sense." "Be prepared to watch Walt Disney movies with her some 200 times. Each." Stay tuned there will be more to come.